When it is time to change the cutting mat on the Swingline SmartCut Lite, Pro 18", Dial-A-Blade Plus, EasyBlade, and EasyBlade Plus Rotary Trimmers or the GBC SmartCut A300, A400pro, and A425pro rotary trimmers, use the SmartCut 18" Replacement Cutting Mat. To ensure a clean cut, regularly flip and rotate mat 90 degrees. Can I use the Carl rreplacement cutting mats on my swingling Smartcut instead of the replacement mats from Swingline, Part No. 9615CM? Thank you for your question. Unfortunately not, replacement parts are designed to be used with their specific brand and model of trimmer. I have the”SmartCut A510pro” the cutting surface is 15” , but the cutting mat is 18 1/2” what should I order? Thank you for your question. For the SmartCut A510pro, Swingline recommends the SmartCut 15" Replacement Cutting Mat which can be found here . What size do I order? 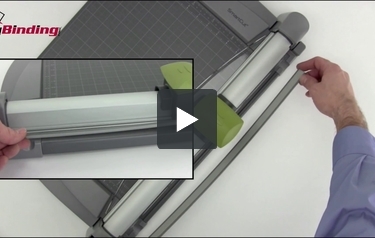 The actual paper cutting area is 15 inches, however the mat part is longer. Is the 18inch the appropriate size?